Sporting a clean white cover and featuring only their embossed name and a serial number printed in gray ink, The Beatles was a strong departure from what had come before. Many of the tunes were written in India where the group had attended a spiritual meditation retreat with the Maharishi Yogi. Recording the tracks in England was a less than blissful experience however. John Lennon was bringing Yoko into the studio every day, Ringo Starr temporarily quit the band in frustration, George Harrison was off doing other things, and producer George Martin was unable to end the bickering or edit the band’s output. The result was an album of thirty songs that bordered on self-indulgent. Tracking down a preferred vinyl pressing for The White Album can be challenging. Several of the songs sound somewhat brittle or compressed, perhaps because the engineers were being asked to “turn up the treble and bass” in the Trident and Abbey Road recording studios. Geoff Emerick served as balance engineer (as he had since Revolver) but he abruptly left after nine songs. So Ken Scott and others took over, enlisting a brand new 8-track recording machine that EMI was reluctant to use. The finished album was a fascinating sequence of linked tracks that couldn’t have been more different. As a result, the best pressings are those that strike a balance between lightly smoothing over the upper midrange and providing additional dynamics to the mix. 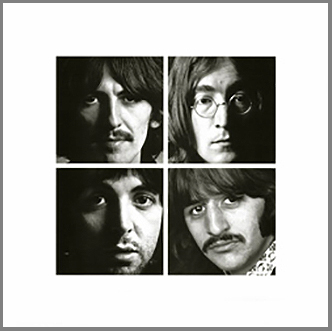 The first UK LP pressings of The White Album, both mono and stereo, feature heavily laminated top loading cover sleeves, seven digit serial numbers, black paper inner sleeves, and a –1 lacquer number on all four sides. The album sold in the millions so quickly that many top loading copies also ended up with –2 lacquer numbers. The mono release was short-lived, and the stereo top loading cover was subsequently changed to a numbered side loading second pressing. The copies that were reissued in the 1978 BC-13 stereo box and the 1982 UK mono box have unnumbered side loading covers, white inner sleeves, and later Apple labels. All of these releases include a photo collage poster and four high–quality portraits of The Beatles.